Do you respect wood? Then these Puzzle Coasters make the perfect place for your mug or glass. Jezebel readers can snag the Puzzle Coaster Set now for just $12 using code COASTER50, a savings of 50%. 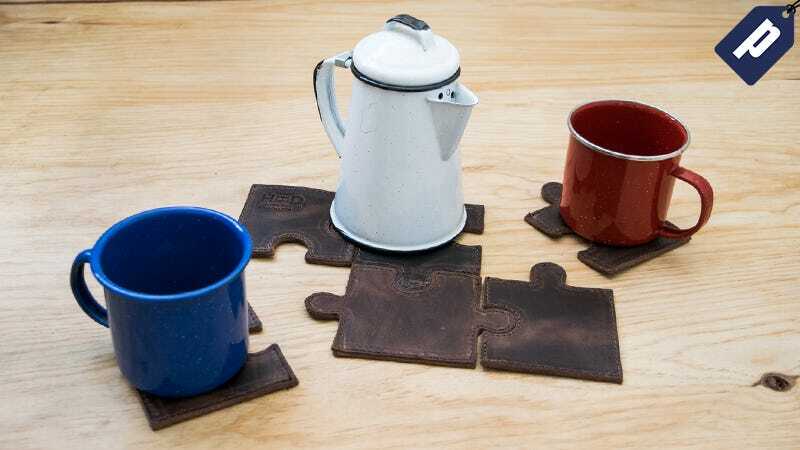 Handmade from 100% Guatemalan full grain leather, the Puzzle Coaster Set boasts durable double-stitched seams and come in a set of six. Use them for individual drinks or put the puzzle together to support a large dish or catering tray. After the discount, the Puzzle Coaster Set is just $12. Plus, Hide & Drink offers additional home products like oven mitts, panhandle covers, and pot pads. Place your mug or glass atop these Puzzle Coasters from Hide & Drink and save 50% now with promo code COASTER50.